TOTAL FLANKER...a rugby blog: Will Rugby Australia finally sanction Israel Folau? Will Rugby Australia finally sanction Israel Folau? Israel Folau is at it again, posting on Instagram this week that hell awaits "drunks, homosexuals, adulterers, liars, fornicators, thieves, atheists and idolaters". Such comments are "unacceptable" according to Rugby Australia. As I've said before, Folau has the right to say whatever he wants. Such bigotry cannot be, however, without consequence. The question remains as to whether Rugby Australia will, unlike last year, finally grow a pair and sanction the bigot? He is only speaking the truth, how is that unacceptable? Read the bible, you will see. And finally it seems as if Rugby Australia have found their gonads with news they and the New South Wales Rugby Union intend to terminate Folau's contract "in the absence of compelling mitigating factors." Whatever they might be. He's entitled to say whatever he wants, but the consequences of that are really up to Rugby Australia. He may not have technically broken any written rules, but in a game that is trying to send out a message of inclusion and acceptance, having one of your top players openly displaying his hatred for [insert long list of people] is just a no-go. From just a business standpoint, you're turning away large swathes of potential rugby enthusiasts just by giving the impression that rugby does not support you or stand by you. Israel Folau can only be doing this if he feels entirely confident in his position in the rugby world, a confidence that Rugby Australia clearly boosted last year. 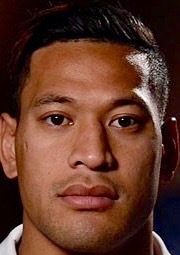 Expelling Israel Folau would not only show rugby's standpoint on the matter, it would also show that it doesn't matter if you're one of the best players in the world, sending out unprovoked hate speech and being a terrible role model for anyone who loves the game means that you are liable to being punished, just like everybody else. Although this might hurt Australia's chances at the World Cup, expelling Israel Folau would gain them appreciation from the entire rugby community, and help the game as a whole. And if Australia doesn't do it, then I hope World Rugby does.